This Presentation date is July 18, 2018 at 9:30 - 11:30 local time. 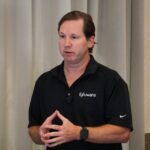 Jeff Gray, CEO and Co-Founder, introduces Gluware, describes the current state of network automation, and highlights the differentiation of using Gluware to automate brownfield enterprise networks. Michael Haugh, Director of Marketing, and Olivier Huynh Van, CTO and Co-Founder, of Gluware show how rapidly users can get started taking inventory of network devices and monitoring configuration changes. Gluware can be used to automate the painful software and firmware update process on network devices, including integrated API calls to vendor and workflow patterns. Presented by Michael Haugh, Director of Marketing, and Olivier Huynh Van, CTO and Co-Founder. This third use case shows how Gluware can automate network configuration feature-by-feature leveraging a powerful declarative provisioning engine to enforce policy on the network. on the network to enable cloud applications and also show integrated changing monitoring. In this use case video, Gluware shows how they can deploy complex features like NAC on switches by leveraging a discovery capability to learn VLANs and access ports to intelligently apply policy.